Short description: If bathroom equipment and whatever related to it is your occupation, we've got something special for you! 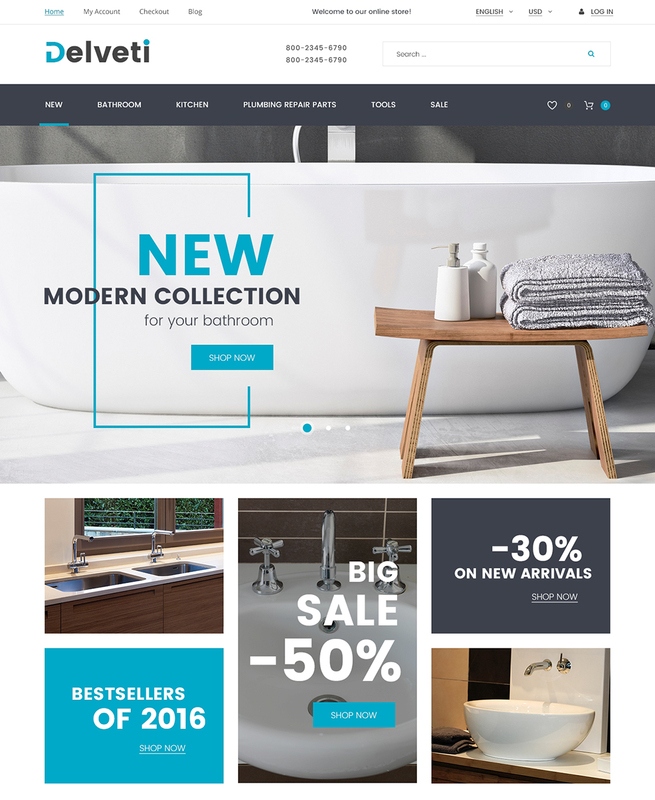 Plumbing Supply Magento Theme is a dream of every plumbing fixtures, sanitary equipment, and plumber supplies store owner. The design was made in the most soothing colors, there are no tacky elements that would distract the visitors from purchase. MegaMenu can be as complex as you need. You can add different types of content for an effective promotion of your products. Slider and carousel will present your popular goods like nothing else can. Thanks to responsive nature of this tools, users will be able to browse the items in a matter of a touch. Ajax wishlist and Ajax compare will be useful to your visitors. They can save desired products for later reference and compare them before making a decision. Smart product labels can easily push to purchase, use them to highlight hot offers. This theme is equipped with handy TM modules. You don't have to buy them separately in order to enhance your website. Save your time and money with Plumbing Supply Magento Theme, build a user-friendly online store in a flash.